As the European Union launches new online privacy protections, and the Pew Research Center releases a report on record levels of American teens’ use of social media, UNICEF and UNICEF USA offer a timely and practical industry toolkit for protecting children's online privacy and freedom of expression. UNICEF and UNICEF USA’s launch of a new Children’s Online Privacy and Freedom of Expression Toolkit could not have come at a more propitious moment for American companies. With the European Union’s (EU) new General Data Protection Regulations (GDPR) having come into force on May 25, 2018, even American companies must comply with these new regulations governing personal data privacy if they interact online with — or sell services or goods to — EU citizens and handle their data digitally. If you are one of those businesses that haven’t put a plan in place because you don’t think the new GDPR regulations apply to you in the U.S., you’re wrong. Fortunately, UNICEF’s timely and practical Toolkit, focused on children’s online protection and empowerment, is already available for American businesses. In a series of recent events, involving partners such as Common Sense Media and Article One and including a Toolkit launch at UNICEF USA’s headquarters in New York, a policy roundtable discussion on children and privacy for lawmakers in Washington, D.C., and a panel, entitled “Young, Safe and Free: Respecting Children’s Online Privacy and Freedom of Expression” at the recent RightsCon conference in Toronto, UNICEF and UNICEF USA unveiled their new Toolkit and explained its goals and utility to companies, policy makers, legislators, academics, child rights advocates and others. children have the right to access remedies for violations and abuses of their rights to privacy and free expression, and attacks on their reputation. 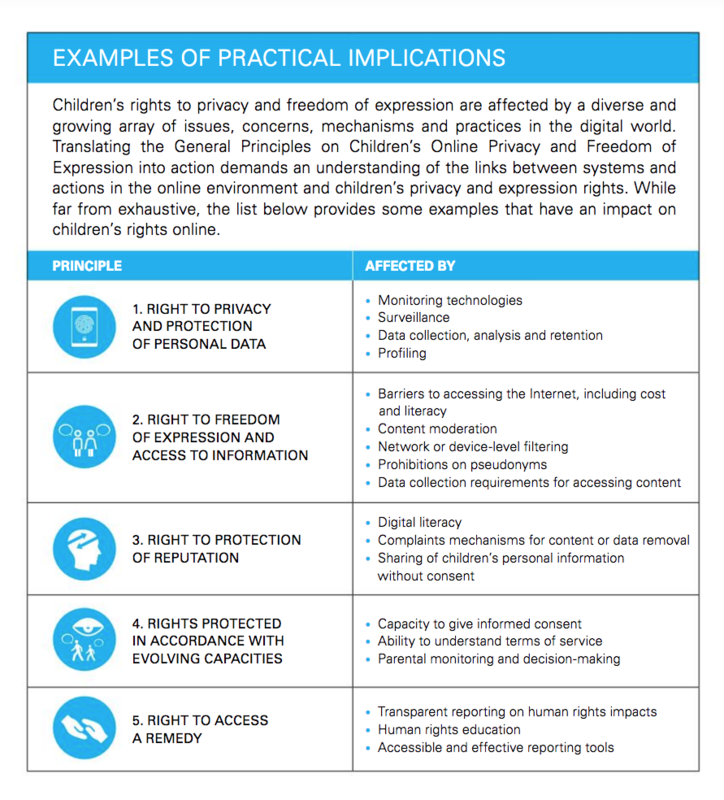 The general principles apply broadly and outline how policymakers, companies, educators, parents and children can respect and protect children’s online privacy rights while also enabling their rights to online freedom of expression. Our accompanying Toolkit checklist offers specific factors companies must consider when complying with children’s basic online rights. For instance, children’s rights to privacy and the protection of personal data are affected by a company’s monitoring technologies, surveillance procedures, data collection, analysis and retention policies, and profiling. Children’s rights to freedom of expression and access to information are affected by barriers to Internet access (including cost and literacy), content moderation, network or device-level filtering, prohibitions on pseudonyms, and data collection requirements for accessing content. Any company that has an impact on children’s rights in the digital environment — from online service providers to game and toy brands as well as operators of online platforms, mobile service providers and device manufacturers — can use the checklist and find additional suggestions in the Toolkit. Both UNICEF and UNICEF USA encourage all U.S. companies to use our Toolkit to ensure that their products and services fully respect children’s privacy and expression rights in a digital world. Since 1946, UNICEF has played a leadership role on — and acted as an effective advocate for — children’s rights, with founding Executive Director Maurice Pate’s insistence that every child, whichever side her parents fought on during World War II, had the right to receive UNICEF’s aid. Today, as a result, UNICEF, its country offices (in aid-recipient countries) and its national committees (fundraising in developed countries) retain a pivotal role in monitoring and advocating for children and children’s rights, nationally and globally. Released in 2011, the UN’s Guiding Principles on Business and Human Rights established a global standard for what business must do to embed respect for human rights throughout their operations and business relationships. Recognizing a need for explicit guidance about what it means for business to respect and support children’s rights, the UN Global Compact, Save the Children and UNICEF led the development of a set of ten Principles on Children’s Rights and Business and released them in 2012. Through their Child Rights and Business initiative, UNICEF and UNICEF USA are seeking to change business behaviour and practices as they affect children by collaborating with a range of stakeholders, including companies, government, civil society, parents, children, and teens. UNICEF and UNICEF USA’s Children’s Rights and Business initiative currently focuses on global supply chains, the information and communication technology (ICT) sector, marketing to children, and the financial industry. We seek to engage new private and philanthropic sector supporters to advance the cause of children’s rights in business around the world and help put more ‘children first’ no matter who they are or where they live. If you — or your company — are interested in learning more about how to protect children online while empowering their freedom of expression, we urge you to access our Toolkit now.